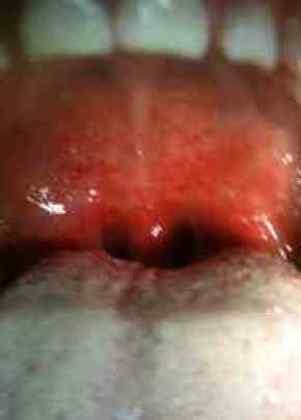 I often get asked what strep throat looks like. Here are a couple pictures of the same patient in my office. Notice the red dots on the palate in the first picture. These are called palatal petechiae and their presence is the best clinical indicator of a strep throat infection. More pictures of strep throat. Below are two recent patients. These patients have obvious red throats with palatal petechiae. Some patients with streptococcal infections will have only mild redness or even normal appearing throats.